The search results are a list of relevant works from the catalogue. If there are many results, they are divided into several pages. At the top of the list, you can see the total number of results and go back and forth between the pages by clicking the arrow on top or bottom of the list or click the page number to go to that page directly. Your search terms will be highlighted in both the search results and title details screens. 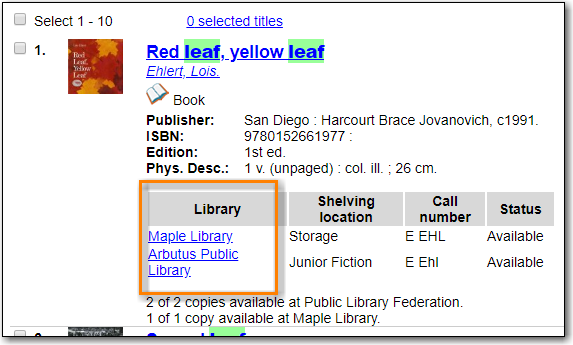 Information about the title, such as author, edition, publication date, call number, shelving location, status,etc., is displayed under each title. The icons below the title link indicate formats such as books, audio books, video recordings, and other formats. Hover your mouse over the icon, and a text explanation will show up in a small pop-up box. Clicking a title goes to the title details. Clicking an author searches all works by the author. If you want to place a hold on the title, click Place Hold to the right of the title information. Above the results list there are Limit to Available and Exclude Electronic Resources checkboxes. Checking Limit to Available will filter out those titles with no available copies in the library or libraries at the moment. Checking Exclude Electronic Resources will filter out titles for electronic resources. Usually you will see your search results re-displayed with fewer results. The Sort by drop-down list is beside the Limit to Available button. Clicking an entry on the list will re-sort your search results accordingly. If you have selected Group Formats and Editions with your search, your search results are grouped by various formats and editions of the same title. Multiple format icons may be lit up. You may refine your search results by facets such as Topic, Place, and Genre. Selecting one of these links on the left side of search results page narrows down the search results to that subject, author, or series.You may also refine your search by clicking the hyperlink labelled Refine My Original Search at top of search results. Refining a search this way allows you to add search filters such as Publication Date, Format, Language, etc., to your original search. You may expand your search results by removing search limiters that you applied in your initial search. You can remove a limiter by clicking on the X beside it. The number of available copies and total copies are displayed below the title details. The availability will be scoped depending on your search library. 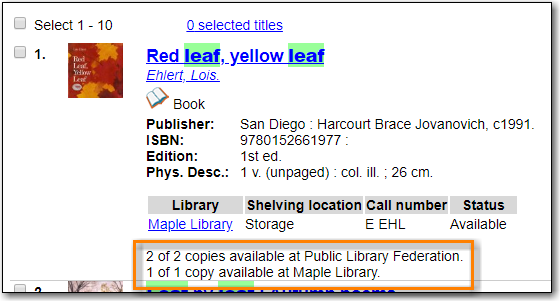 If your library is a multi-branch system you can see how many copies are available in all branches. If your library participates in a larger borrowing zone you will see the available copies at your search library and the larger zone. If you are searching multiple branches or libraries you will see the libraries with copies listed. Click on a title to view a detailed record of the title, including descriptive information, location and availability, and options for placing holds. The record shows details such as the cover image, title, author, publication information, and an abstract or summary, if available. 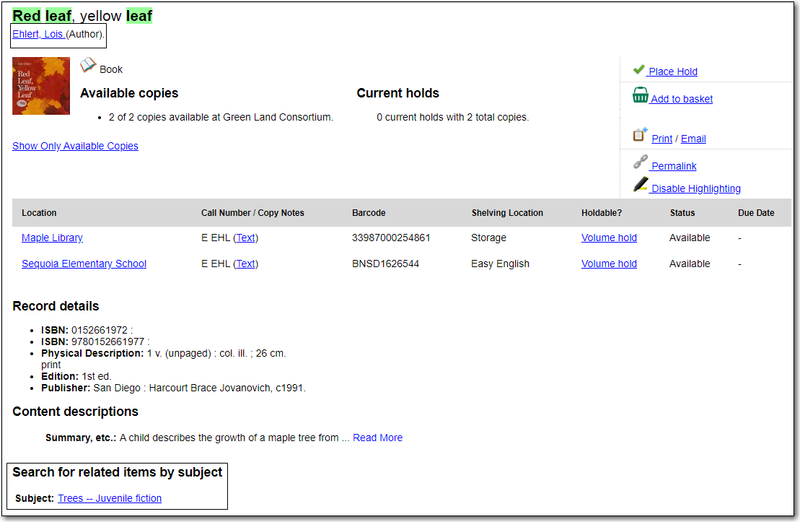 The Record Details view shows how many copies are at the library or libraries you have selected, and whether they are available or checked out. It also displays the Call number and Copy Location for locating the item on the shelves. Clicking on Text beside the call number will allow you to send the item's call number by text message, if desired. Clicking the location library link will reveal information about owning library, such as address and open hours. Below the local details you can open up various tabs to display more information. You can select Reviews and More to see the book’s summaries and reviews, if available. 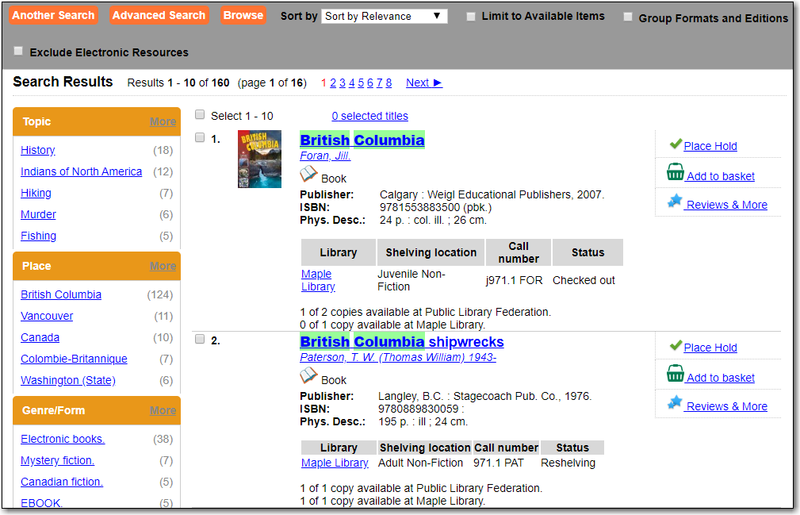 You can select Shelf Browser to view items appearing near the current item on the library shelves. Often this is a good way to browse for similar items. You can select MARC Record to display the record in MARC format. If your library offers the service, clicking on Awards, Reviews, and Suggested Reads will reveal that additional information. 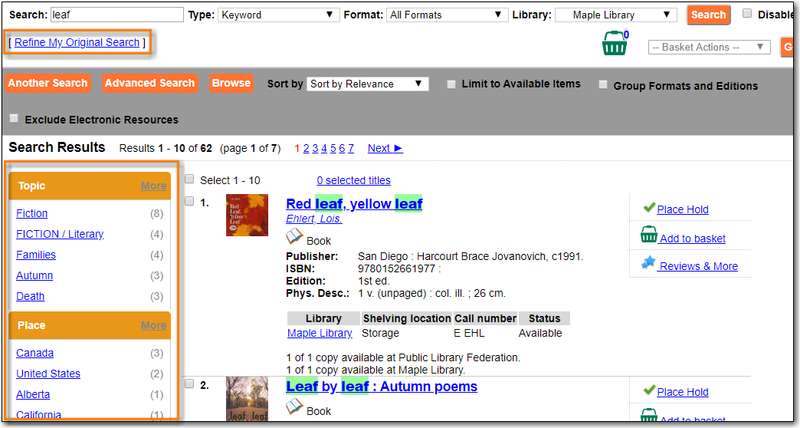 You can search for additional items by an author, one of the subjects in the record or other works in the same series. Clicking the author, subject or series will start a new search in the catalogue. You can do this from the results page or from within the record details view. When you are viewing a specific record, you can always go back to your title list by clicking the link Search Results on the left of the page. If you have selected Group Formats and Editions with your search, your search results are grouped by various formats and editions of the same title under My Search Results. You can always go back to this page by selecting the link to Return to Grouped Search Results. You can start a new search at any time by entering new search terms in the search box at the top of the page, or by selecting the Another Search, Basic Search, or Advanced Search link at top of search results, depending on what screen you are on when wanting to do another search.